In my family the hands down favourite way to enjoy the quince harvest is to poach them up whole, skins and all. That’s the way I’ve done it here, but you could peel and core them with a sharp paring knife, slicing up the halves into wedges before poaching. Cooking the fruit whole means that you easily infuse everything with the goodness of the skins and the seeds, otherwise you’ll want to boil these trimmings up in a second saucepan and add the liquid back in to the poaching pot. The skins are high in pectin so you can make a jelly from the syrup, and the seeds are an age-old remedy for a sore throat, so don’t waste any of that delicious juice! Rub the downy fuzz from the quinces with your fingers and give them a good wash. Slice away any dark spots from the skin. Nestle them in a large heavy-based saucepan, cover with water and add sugar and a cinnamon stick or vanilla pod. *Addition! Also the slice of lemon, I forgot to mention that goes in the pot, too. Bring to the boil and then reduce the heat to a low simmer. You want to keep the quinces submerged so place a piece of baking paper (roughly cut to fit) on top of the fruit or use a plate that fits well to keep them under. Lid on, and simmer on the lowest setting for several hours. As soon as they are soft they can be done, but there’s a special joy in that sublime quince colour and deeper flavour, and it comes from a slow and relaxed pot ticking over on the stove. Whole quinces may take around 4 hours to become a beautiful ruby red. Sliced quinces would need less, but still we’re talking 2-4 hours here people. But for quinces, take the slow road and you won’t regret it. 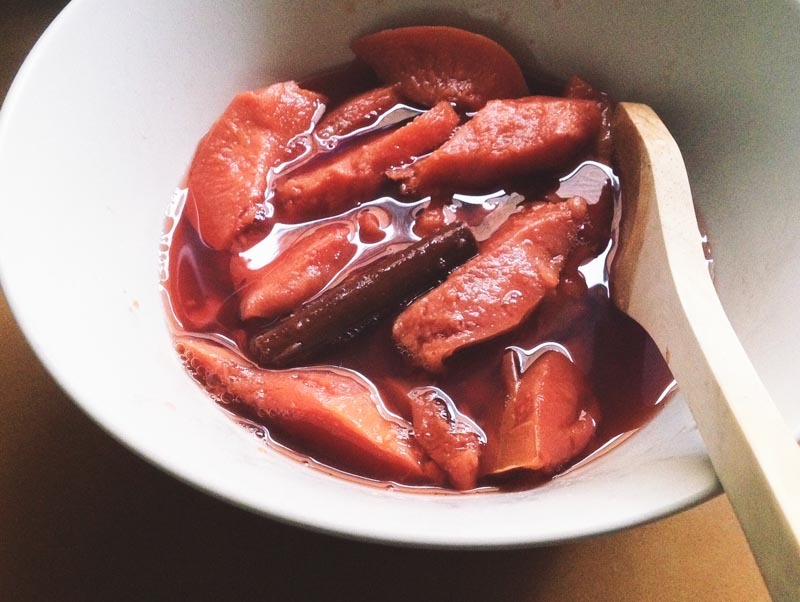 Let the quinces cool in their poaching liquid. Cut away the cores – no need to peel unless you want to. Serve them whole with some syrup and yoghurt, or slice them up for a cake or to add to your breakfast bowl. You can also pair the fruit or syrup with strong meats like roast lamb or a hearty Moroccan tagine. Poached whole for about 4 hours as directed and they were absolutely delicious! Served with custard and coconut ice cream for an amazing dessert. Stop it that sounds too delicious. Ps NICE ONE!